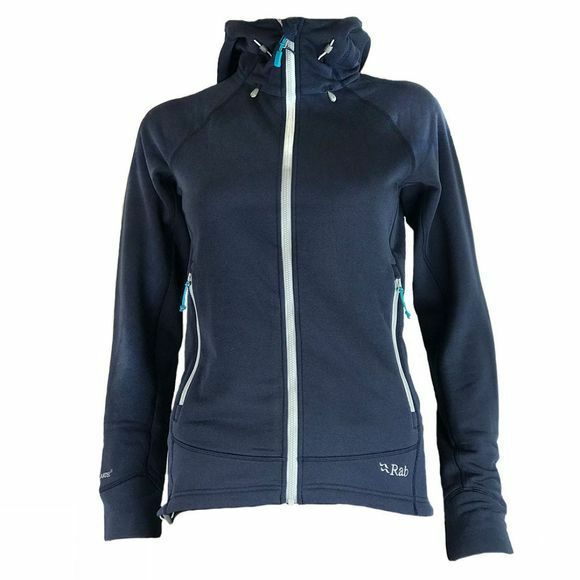 The Women's Power Stretch Pro Hoody from Rab is a medium weight fleece for active mid-layer use. It is an excellent option for those cold dry days which could potentially end up in a downpour of rain, use it for insulation and wind protection but still have a waterproof in your bag for when the rain comes. It's flatlock construction ensures it will layer exceptionally well and the soft, wicking fabric is cosy next to the skin but will also layer perfectly over a baselayer. The hood and hand pockets offer your head and hands a warm haven whether you are on the move or not.